It is great to have a friend like Jorge Espinoza, who helps me get such great bottles of beer from around the world. You all need to check out his beer review blog, animebeers.com, he does perfect beer and anime pairings in his reviews, similar to how I do Metal pairing with my beer reviews. This is my first beer ever received from this Denmark brewery, Beer Here. This one was specifically ordered, as the label and ingredients had my attention upon first gaze. I love pumpernickel bread, and this beer says it is brewed with rye and fennel seed to give this beer a pumpernickel-like taste. The label features as mad looking baker pulling out a pint of a porter from a brick oven with a baker’s peel. The evil looking grin on his face sealed the deal for me on this awesome looking label. The large text used for the word “Mørke,” or “dark” can easily be seen gracing a good Metal album cover. Pouring this beer into a short stemmed chalice, or porter style glass, this beer came out a deep, heavy looking opaque black color. The initial pour gave this beer a 1 inch dark khaki foamy head. There was great head retention throughout this session, leaving a sticky sheet of lacing down the glass. The aroma was a lot of roasted malts and grains up front, followed by a wonderful combo of chocolate, licorice, nuttiness, dark rye bread, fennel spiciness, and a hint of anise. Behind all these specialty aromas lies a hint of bitter earthy hops, and dark fruits like prunes and raisins. Dark rye bread aroma lingers in the nose. 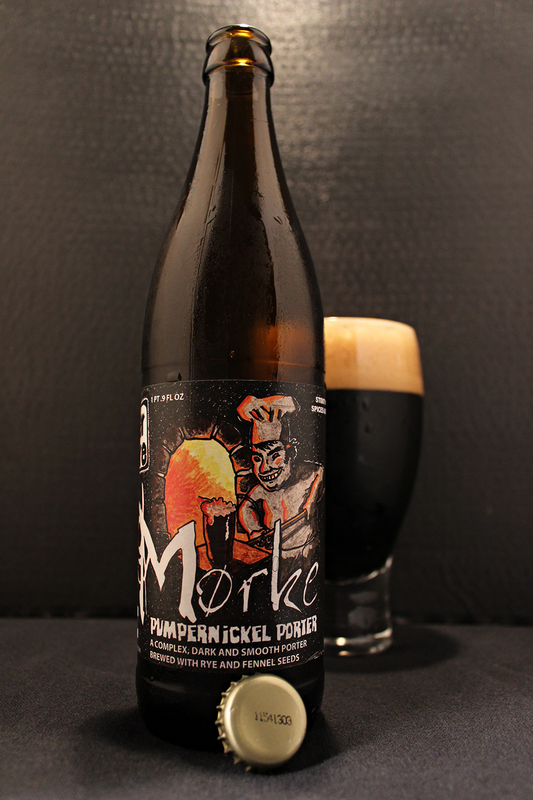 The taste of Mørke Pumpernickel Porter has all the same characteristics just like the aroma. Dark rye bread flavors, roasted malts, grains, with a bit of fennel seed, followed by a hint of chocolate, licorice, spiciness, and nuttiness. here was a good amount of dark fruit flavors as well, like prunes and raisins. Earthy hops were present.The finish and lingering aftertaste is all dark rye bread. The body was a tad bit heavier than medium. It had a smoother and creamy mouthfeel with moderate carbonation. The finish was sticky and dry. Overall, this was a fantastic beer, and I am very happy to have received this beer. Again, I have to have to thank Jorge for helping me get this beer. This was my first beer from the Beer Here brand, and I hope to get my hands on more. I was intrigued by the label and ingredients, and Beer Here did not disappoint, and delivered on it’s promise of a pumpernickel porter. This beer is available on CraftBeerKings.com. Only a few left. Metal Connection: Through the Metal database I went, searching for a perfect fit for this beer. 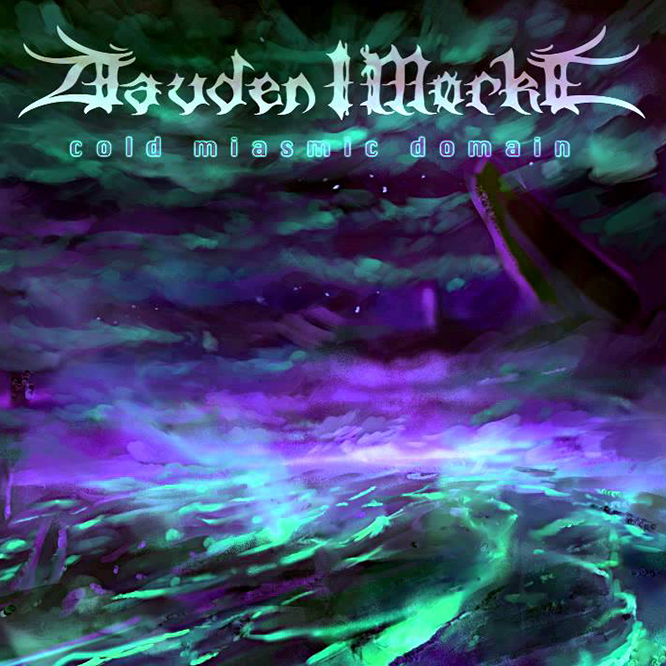 I found this Black Metal band named Dauden I Mørke, hailing from the unholy land of Detroit, Michigan. Yes, I am being sarcastic. After my initial discovery of this band, I found myself mainly digging through the 10 tracks from their 2014 full length release, Cold Miasmic Domain. Their music is raw, ugly, yet very catchy, and very well put together. There are elements of old school violent, fast Black Metal, groovy heavy metal riffs, folk-like music, classical, and even gothic. As each tracks plays, I do find parts in each which I highly enjoy. They do have some synth goth dance beats in one part I heard on this album, but it wasn’t horrible, just a little weird for my taste, but for the most part this album was highly enjoyable. I, especially, really enjoy the song I chose for this Metal Connection, “Revolution Sathanas.” This song has speed, anger, evil, raw aggressive Black Metal. This song reminds me a lot of my favorite Black Metal band, Naglfar. Please check out this track, and see that there are musicians in Detroit, Michigan who can summon the beasts just like our friends in Europe.